What do millennials in New York City love most? Brunch! Tell an audience you're giving them brunch food, you might get them to the theater. Brunch Theatre is brining eight new plays to the stage in Bangerz & Mash. 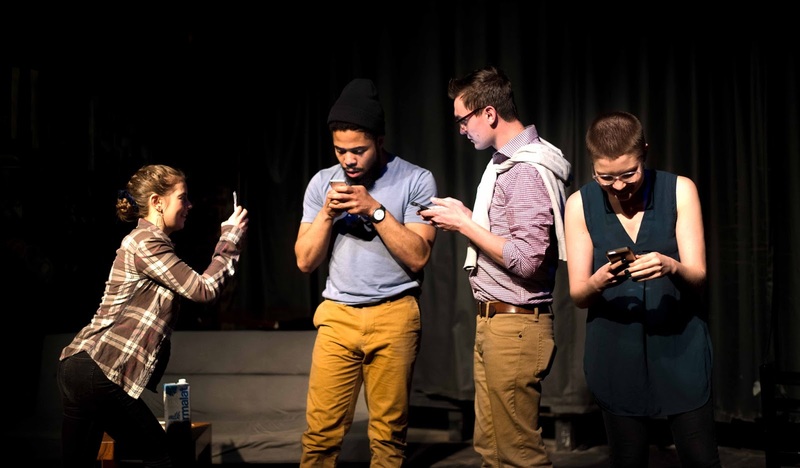 Brunch Theatre is millennial artists creating millennial theater about millennial topics for a millennial audience. Dropping references from today, from social media addictions to dating app woes to one night stands, these eight plays do their best to keep you captivated. Mostly rooted with comedic undertones, the overwhelming theme of the night is celebrating the generation and our real world problems. With eight offerings and live musical interludes provided by Kerri George and Lydia Granered, the night featured some dishes both hot and cold. The hottest dish by far was the silent slapstick comedy of filth, Sexybeer by Zachary Connolly. Michael, a nebbish guy, seduces the sultry Zoe at a restaurant. Told through impeccable physical lead by the chameleon of the stage, Forrest Weber, and the sultry Hanah McKechnie, this play, directed to the hilarious extremes by Liz Rogers, will leave you, and the stage, wet. Sexybeer defines the power of strong storytelling. Of her three appearances in the night's program, another great play was the heartbreakingly beautiful Tantalus, or Whatever by Haley Jakobson. A play about moving on and letting go of love, Conrad is visited by his deceased boyfriend on the night of their anniversary. Only getting seven minutes in heaven, Jakobson showcases a beautiful relationship as the pair grapples with their circumstance. Ryan Meyer as Conrad and Lukas Papenfusscline as his former flame had a natural chemistry. His costume was fitting as Papenfusscline was perfectly angelic. Rounding out the hot was Harrison Bryan's far too real Get Off Your Cell Phone (or World War III). World War III is upon us and four millennials are wound up on likes, and lack there of. A satirical comedy on the state of our priorities, Bryan paints a picture that ironically carried through into the audience. But more on that later. Sometimes absurdity can be comedy gold but there were a few misfires. And it started from the jump. Conceptually, Overshot by Taylor Beidler had all the right pieces, the execution missed the mark, dragging on a couple beats too long. Similarly, despite a fantastic punch line, Long List of Ex-Lovers by Trevor Stankiewicz needed to be shrunk to truly match the brilliance in concept. Bangerz & Mash leaves you with a full stomach. Maybe dropping an entree or two may have been most satisfying. In a time where art is important, it's the millennial generation leading the charge. Brunch Theatre is taking advantage of it! Just expect to see some phone glows as you view as some of the crowd will be watching their snaps on snapchat during a live performance. Serve it up to the attention span of the demographic I suppose.